Let us have another wonderful year of slow releases! Nothing else to report, so see you next month. Who’s your mailman? Maybe we can treat him to a little “holiday” to stop him bothering you. Dare ga tame ni Kemono ha ikitai to itta. Isekai Meikyuu de Harem wo. Hige wo soru. Soshite Joushikousei wo hirou. Slime toshite 300nen, shiranai uchi ni lvl max ni natteshimatta. Sekkaku cheat wo moratte Isekai ni teni shitandakara, sukinayouni ikitemitai. Isekai de Slow Life wo. Good to see this back in production, my friend. Princess Freya heaved a sigh as if to say “This is going to be a stiff piece of work”. Perhaps it should have been: Princess Freya glanced at Zenjirou’s crotch and heaved a sigh as if to say “This is going to be a STIFF piece of work”. And didnt know u read this oO Isnt it a bit too tame for your tastes? Thank you very much. Blew away my hump day fatigue! Was waiting for this one for ages! 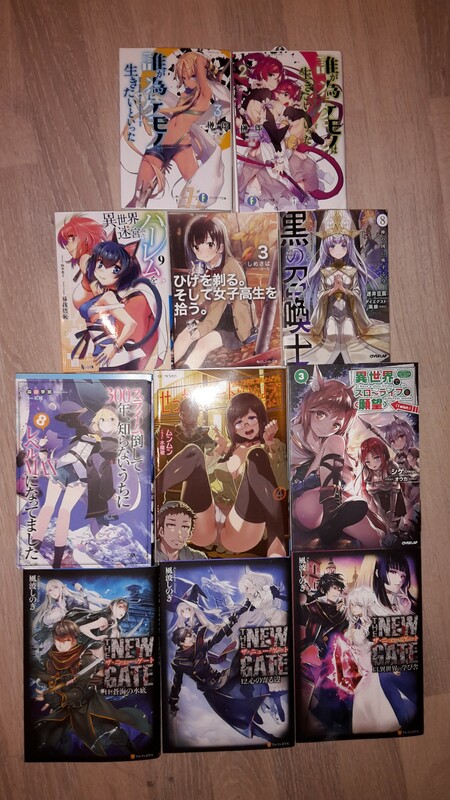 Im so regretful I cannot read japanese, these LNs look so freaking tasty. Thanks for your effort every time. I really like this novel and wait for the next chapter in eager. Just as a side note, I know that there is no such sound at Japanese, but it should be “Potosi”, and not “Potoshi”. Just saying, its up to you how to use it.